I know it has been forever since I blogged, but I am sure you will all forgive me by the time this post is done. Homeschooling has taken up nearly all of my time. We may or may not have found a solution (no, he is not going back to a classroom), but it is too early to tell. 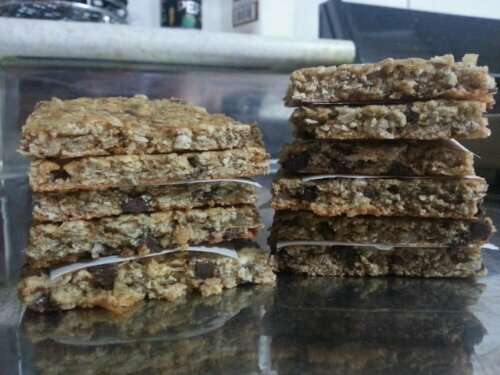 The last two days were ideal though, leaving me with free time to finally accomplish a long desired project: home made granola bars. I have a serious addiction to Fiber One bars, and want to make my own where I know exactly what is going into them and am not spending an arm and a leg on something I can make myself! I tried a recipe a few months ago involving pumpkin, for the holiday pumpkin craze, but it just wasn’t what I was looking for and I didn’t have time to experiment again. The ones I made today, however, are spot-on. They came out thin, and I was left wanting a thicker bar, but that was probably just the fat girl in me wanting more cake. These are superb, and I am definitely making these again, and will be trying out different fillers as I go. 1. Preheat oven to 350°F and line a bar pan/cookie sheet with parchment paper, leaving excess paper folded up over edges. This will be your best friend for the cooling process! Also, set out two cookie cooling racks next to each other, you need a space big enough for a bar pan/cookie sheet to fit. 2. In large mixing bowl, combine all dry ingredients, finishing with chocolate chips and coconut. 3. In a separate bowl, combine wet ingredients. 4. Fold wet ingredients into the dry and mix well. 5. Empty mixture onto the pan and spread out with spatula, as evenly as possible. Take another piece of parchment paper, or saran wrap and lay on top of the mixture. Press firmly all over to form the conpressed bars. Use a rolling pin if you’d like – you seriously want to sqush it hard to press it all together – this will help keep them from falling apart. 6. Remove extra parment paper or saran wrap and bake for 18 minutes, then replace parchment and press again to re-compact (be sure to keep a pot holder between you and the parchment, if you are using your hands! 7. Lift the bottom parchment paper carefully from the pan and place on cooling racks. Cool completely before cutting. Cut however big you want, mine cut out to 24 bars. Store in freezer or refrigerator. I put pieces of parchment between them to keep them from sticking to each other. Try not to eat them all at once, and don’t forget to share with your friends.